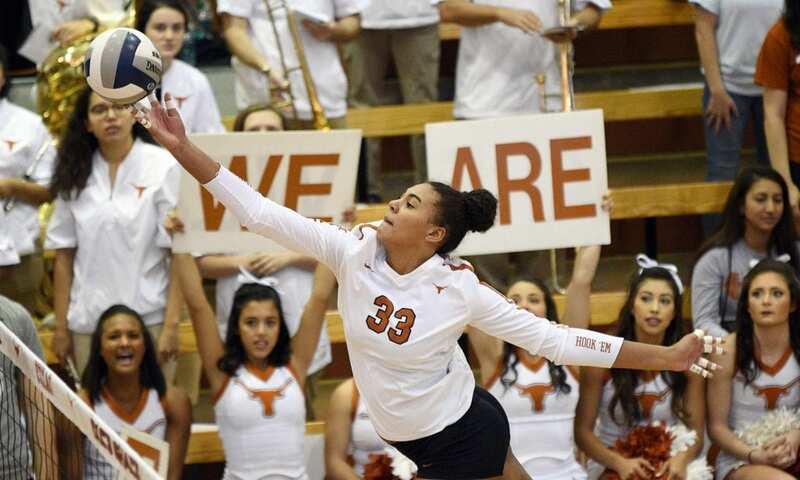 Logan Eggleston helped lead Texas to a sweep over visiting Oklahoma Saturday (photo courtesy of texassports.com). 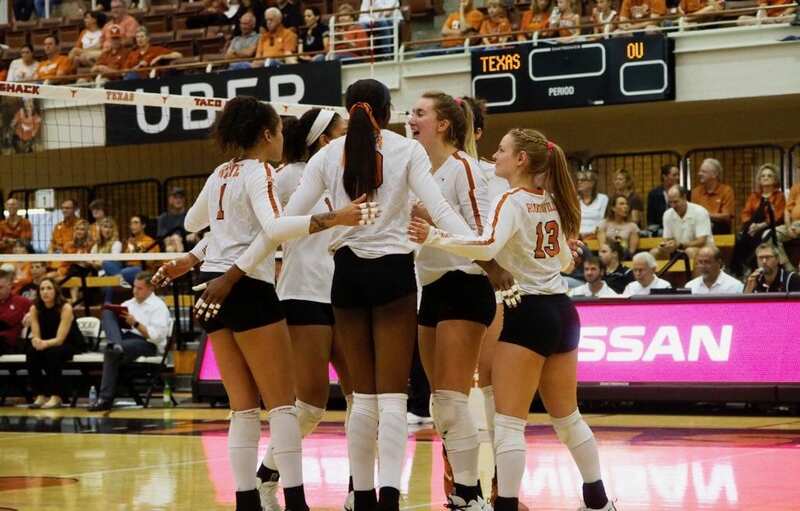 AUSTIN, Texas — The Texas volleyball team cleaned house in front of a sold-out Gregory Gym Saturday, sweeping past Oklahoma, 3-0. The No. 8 Longhorns took it to the Sooners from the start and held on for a close third-set win to clinch the match, 3-0 (25-15, 25-20, 25-23). With the win, Texas now sits at 14-5 overall and 9-1 in Big 12 Conference play. Texas fell behind, 9-5, early in the third but rallied to bring home the victory. Leading the way once again for Texas, junior Micaya White had 13 kills (.344) on 32 swings with only two errors in the win, while also adding nine digs and an ace. Also coming up big in the win, freshman Logan Eggleston thumped 10 kills (.227) to go with two aces, one block and one dig. Fellow freshman libero Sydney Petersen and Brionne Butler also put Texas in position to succeed. Petersen paced the Longhorns’ play from all sides, getting down for 13 digs as she collected double-digit digs for the 15th time this season. Butler recorded seven kills and three blocks. The Texas Longhorns huddle together during a win over Oklahoma Saturday (photo courtesy of texassports.com). Sophomore Ashley Shook kept the offense moving with 31 assists, adding seven digs and four kills (.571). The Longhorns out-hit the Sooners .309 to .208 as Texas hit better than .300 for a third straight match. In Texas third-straight sweep, senior Yaazie Bedart-Ghani had five kills and team-high four blocks and fellow senior Morgan Johnson added three kills and three blocks. Juniors Claire Hahn and Autumn Rounsaville had four and two digs, respectively in the ‘Horns sixth sweep of the season. Texas is back at Gregory Gym to face Texas Christian University at 7 p.m., Wednesday, Oct. 31. 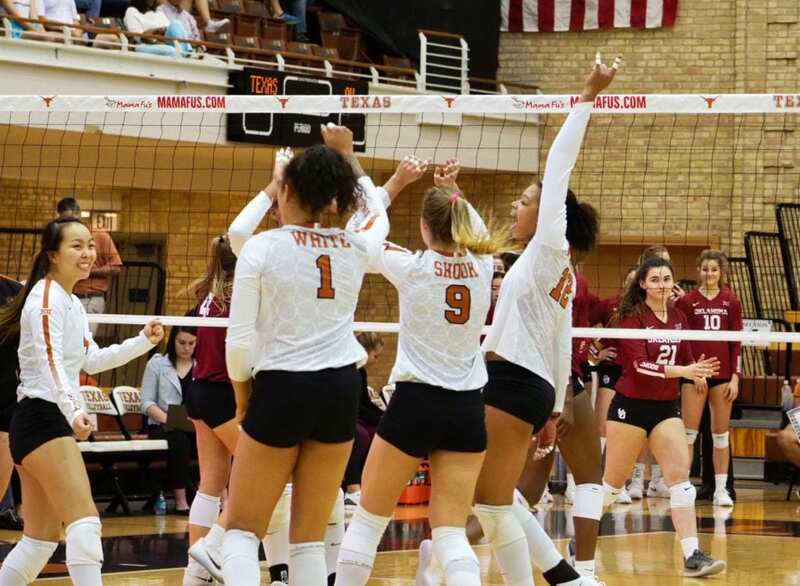 The Texas volleyball team celebrates a point during its win over visiting Oklahoma Saturday at Gregory Gym (photo courtesy of texassports.com).